Lower back and buttock pain relief is pretty simple to achieve , in most cases. Most likely there are one or two muslce groups that are causing the problem. All you have to do is take your time with the techniques I show you, and you'll do fine. Just follow along with the videos. Using various sports balls of various sizes to see what works best for you, do the tennis-ball-press technique with whatever ball you deem the best. Go through all the muscles in your hips, on both sides, top to bottom and release everything you find that is tight. Do the Reclined Hip Stretch and notice where the tension is when you do this specific stretch. You may find it high up in your hips or down near the bottom of your tailbone, or anywhere else. Wherever you do still happen to find tight tissue when doing the stretch, take out whatever sports ball you choose and to the tennis-ball-press technique on that area. And then repeat this process on any other tight spots you can find doing the Reclined Hip Stretch. Do this entire process with the Seated Hip Stretch. And lastly, repeat this entire process with the Seated Crossed Legs Stretch. The point of this entire "stretch and assess" is for you to be an investigator to find the tight tissue in your own pelvis. Every body is unique and the way you as an individual use your body is unique. So, while you'll have a great deal of tension where everyone else has it, you may be hiding some tension in different places that I want you to locate and release. Releasing any inappropriate tension in your body will only help your body. Lower back and buttock pain can often be caused by the muscles on the front of your spine and pelvis being tight. So, we're going to make sure they are not inappropriately tight. 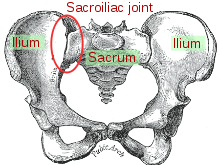 Your iliacus and your psoas are the two muscle groups we'll be targeting. The Press-Hold-Move Technique and the very helpful Hand-On-Hand Technique are a great way to release these two big, powerful, very important muscles groups. Definitely review the video to see how this is done properly. With the weight of your leg pressing a softball into your hamstring, use the press-hold-move technique to release any tight/painful/tender tissue you find. Just like the "stretch and assess" process like we did in Video 1, you want to be a bit of an investigator when it comes to finding tight tissue. Take a few minutes and try out different areas all along your hamstrings to discover where you may be hiding tight tissue. Don't just go up the middle of the back of your leg. While still on the back of your leg, move to the inside or outside a bit and see what you discover! It will only help. As the pictures here depict, doing this hamstring stretch is quite simple, and the great news is that it's also highly effective at releasing your hamstrings. Always keep your legs as straight as possible. Always flex your quadriceps as hard as you can when you do this stretch. You will see pretty rapid improvement if you do this stretch regularly. You can do this multiple times a day if you like. Do a morning, afternoon, and evening session if you'd like and you'll be amazed at the progress you make. Or just do one or two reps throughout the day whenever you have a moment. A little bit is better than none at all, so "don't let the perfect, be the enemy of the good". For all of the above areas you will do the tennis-ball-press technique. So you will basically press into the tissue in these areas with your bodyweight onto a tennis ball. When you find a tight/painful/tender area then you will motion your leg up or down, twist your leg, or move your leg in any manner that will get the tissue you are pressing the ball into to move. As you force the tissue to move under the pressure of the ball it should begin to release. Be patient and persistent and you'll be able to get a lot of good work done in these areas with this technique. Which techniques gave you the most lower back and buttock pain relief? Did Step 1, Step 2, 3, or Step 4 work best? Was there one specific treatment that instantly relieved your pain? Remember what worked best for you, so you can do that first next time the pain occurs. Are you still experiencing some pain? Which muscles are still tender/painful (that means they are tight!) and could use some more work? These remaining tender spots may be the cause of your remaining lower back and buttock pain. Investigate a bit and you'll eventually find which techniques work best for you to provide the best lower back and buttock pain relief. Then you'll be able to fix yourself whenever you desire because you'll have your own personalized lower back and buttock pain relief treatment……literally at your fingertips!